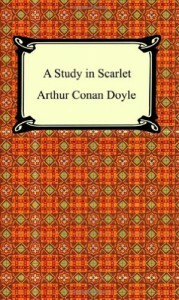 After I read The Lost World, I was eager for more brilliance from Conan Doyle. And I loved this short novel. I knew of Sherlock Holmes through "reputation", as one of the most celebrated characters in British fiction, and there seemed to me to be a certain exclusiveness to the "I have read Sherlock Holmes" society, that I wanted to find out more about and possibly be part of. Conan Doyle has that writing style and flair that makes him immediately seem a great friend to the reader, someone who you can trust to entertain and educate. There are a few memorable quotes and lines, and some real insights into the mind and human behaviour. The abrupt change of scene and story half way through, in my opinion, is delightful for the way it introduces one to a vastly different strand of life, existing simultaneously but thousands of miles away, yet still weaves the two together. The pseudo-historical feel to the Mormon tale adds to the piquancy. I wonder if the author was the first to pull off a trick like this, now commonplace in novels and films?